We are Cunard specialists and will find you the very best Cunard cruise offers, all with great savings. Look out for our special cruise promotions with complimentary onboard spending money, complimentary car parking at Southampton, complimentary return UK coach transfers and exclusive Cruise Village savings. Our team of Cunard experts regularly update our Cunard offers and also our Cunard World Cruises. We specialise in Cunard Transatlantic crossings with a stay in New York and during the winter months, Cunard Exotic Voyages to the Far East, Australia and South America can be taken onboard Queen Mary 2, Queen Elizabeth and Queen Victoria. Cunard’s “White Star Service” is something we want to share with you, therefore we make sure that every member of the Cruise Village team has achieved the highest level of Cunard training, and is on hand to assist you finding the voyage that’s right for you. A Cunard voyage is a unique escape into an extraordinary world, every day. So why not secure your holiday today with a 5% deposit? What's more, book these voyages on the Cunard Fare by 30 April 2019 and receive double on board spending money. T&C's: Prices shown may be "saver fares" as these are often the lowest fares. They are subject to availability based upon 2 adults sharing the lowest available grade within the stateroom type specified and include Taxes, Fees and Port Expenses. If you require the Cunard Fare please call for live prices and availability. Offers are not combinable with any other discount or promotional offer. Book an applicable 2019 Cunard Fare holiday and receive additional on board spending money to spend during your voyage in the on-board shops, bars, photo and art galleries and on internet packages, restaurants, spa and shore excursions booked on board. Applicable to new Cunard Fare bookings on selected voyages of 7 nights or more departing 2019 booked by 30 April 2019. 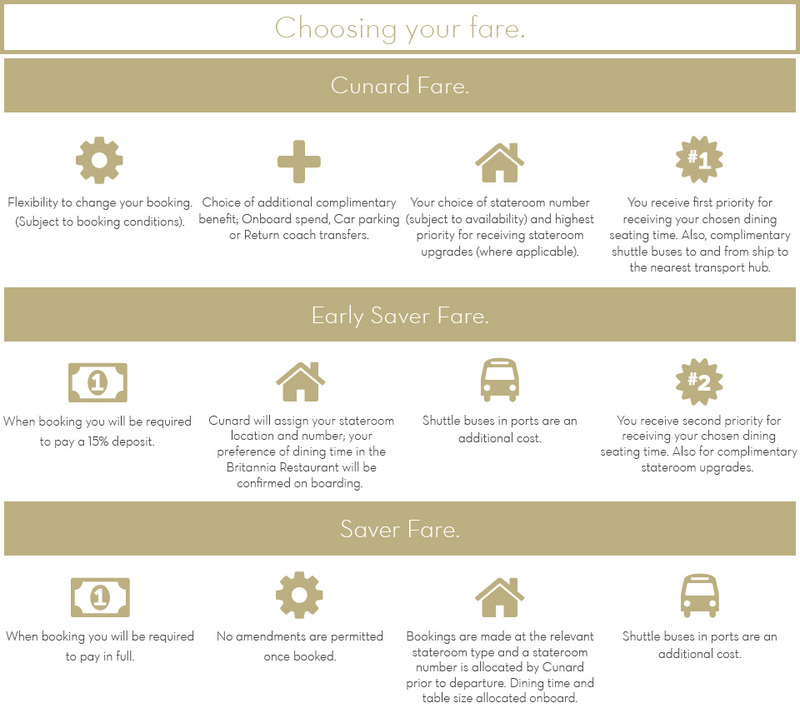 On board spending money is additional to the Cunard Fare benefit of on-board spending money/car parking/return coach travel (choice of benefit dependent on cruise type, duration and time of booking). On board spending money amount shown includes the Cunard Fare benefit of on board spending money plus the additional on board spending money, which doubles the total. On board spending money can only be spent whilst on board. Offer is only applicable to Cunard Fare bookings and cannot be exchanged for a cash alternative.